Hungary – Magyar Posta is launching a new series of special stamps on the subject of regions and towns. 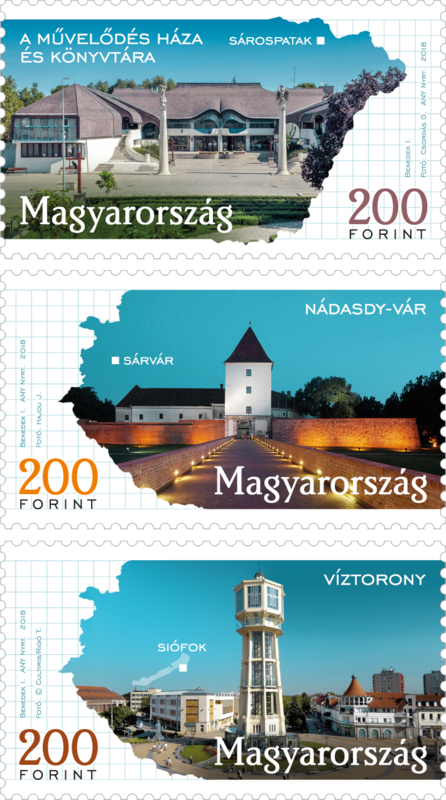 The first three stamps in the series feature Sárospatak, Sárvár and Siófok, each celebrating the 50th anniversary of being granted town status. As well as showing the main sights, the composition of the stamps allows the position of the towns to be indicated on the map of Hungary. One hundred and fifty thousand copies of the stamps designed by the graphic artist Imre Benedek were produced by ANY Security Printing Company. The new issues will be available at first day post offices and Filaposta in Hungary from 1 June, but may also be ordered from Magyar Posta’s online store. Sárospatakin the Zemplén mountains lies on the river Bodrog. 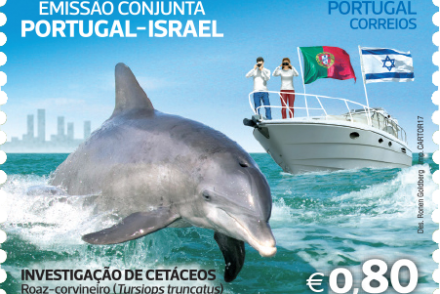 It is a small town rich in cultural values, monuments and steeped in history. It is a true jewel box where the past and present live in symbiosis. One iconic institution is the Reformed College with its neoclassical main building, where education has been provided continuously since 1531. The College has been one of the intellectual mainstays of the town for centuries. The Rákóczi Castle and Museum, a historic building complex combining Gothic and Renaissance architecture, evokes the past. The town’s baroque and eclectic buildings form an integral part of the built heritage, which includes buildings designed in an organic style by Imre Makovecz, such as the Cultural Centre and Library, shown in the stamp, or the Repositorium and the Árpád Vezér Grammar School. The aforementioned Rákóczi Castleis depicted on the first day cover and the special postmark used a stylised drawing of the town’s coat of arms. Sárváris a small town in western Transdanubia situated on the two banks of the river Rába, which provides the geographical axis of Vas county, to the south of its confluence with the river Gyöngyös. The town was given its name (literally “mud castle” in Hungarian) as the castle there was surrounded by a marshy area in the Árpádian era. 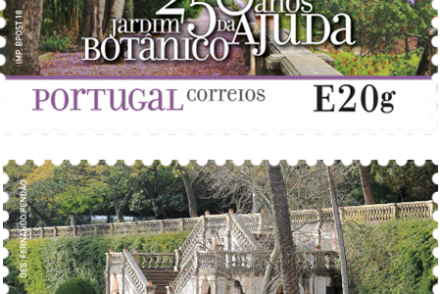 The stamp design features the symbol of the town, the Nádasdy Castle. The castle belonged to members of this influential family in Hungarian history during the 16th and 17th centuries. It was then that the building acquired its late Renaissance form. Today there is a museum in the castle, which presents the history of the family and the bequest of the castle’s last royal owner, the Bavarian Wittelsbachs. Hungary’s only permanent exhibition devoted to hussars can also be seen here. The development of the town in the first decade of the 21st century largely rested on the upturn in health and tourism services, and thus the open-air pools of the Sárvár Health and Wellness Spafeature on the first day cover and a stylised drawing of the town’s coat of arms is used for the special postmark. Siófokon the eastern shore of Lake Balaton is a fascinating and diverse town with considerable tourist values. It is one of the Balaton’s and Hungary’s major tourist centres in summer. Everyone adores the town’s beach with its shallow, gradually deepening water inviting them to swim. Apart from the refreshing water providing rest and relaxation, visitors can enjoy the sights, organised events and cordial hospitality. Hotels and restaurants in the modern sense have been present here since the end of the 19th century, which provided a sound basis for the rapid and impressive changes that the town underwent within a few years. 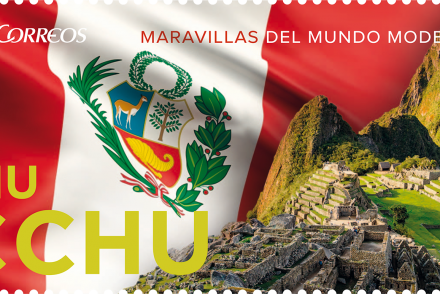 The stamp features the town’s emblematic building, the 45-metre-high Water Towersituated in the centre of the town. The special feature of the building, inaugurated in 1912, was the two panorama lifts installed to reach the look-out tower levels, where visitors could see breathtaking views of the surroundings. The main motif of the first day cover is the Angel of Peacestatue at the end of the Siófok jetty, and the special postmark is a stylised drawing of the town’s coat of arms.